Football fans were gifted to a classic European tie when Manchester United were drawn against Barcelona in the Champions League quarter-finals. Twice this has been a matchup in Champions League finals so it doesn’t need much of a push to build up. Two elite clubs that can boast great history and some dealings down the years. 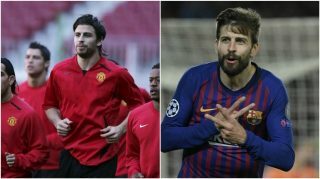 Former United defender Gerard Pique is clearly excited about the prospect of facing his old side, with the Barcelona stalwart jumping to Twitter to let everyone know how he feels about facing Ole Gunnar Solskjaer’s men in the Champions League. “I’m coming back to my second home,” Pique wrote, attaching a graphic shared by the official Man Utd account. Pique spent four years at Old Trafford before returning to Barcelona where he became one of the world’s best defenders. He picked up a Premier League winners medal in 2007/08, which is one of many honours from his incredible career at club and international level. He will get a good reception at Old Trafford, his second home.